If you, your family or a family member is moving to Wyoming there are a lot of resources that can help. Here are a couple links that will provide more information. This page will provide some basic information about Wyoming, Campbell County and the City of Gillette. To explore more about what it is like to live, work and play here check out those pages on this site. Home to both the largest elk herd and the largest coal reserve, when moving to Wyoming, you’ll find it’s as rich in scenery as it is in natural resources. Wyoming is a state proud of its equality, history and culture, with a future as carefully balanced as the rodeo stars who compete at the state’s county fairs! The following tips will help make your move to Wyoming a successful one. Moving permits are not required when moving to Wyoming. The best time of year for moving to WY is the summer or fall, when it’s less rainy and the temperatures aren’t as extreme as during the spring and winter. If you’re moving to Wyoming to areas around the national parks, allow yourself plenty of time. Tourist traffic can lead to congested roads at all times of year – especially during the summer in Teton and Park Counties. All of the cities in Wyoming host well-attended festivals and events, such as the Cheyenne Frontier Days in Cheyenne. Pay attention to your city’s calendar to avoid delays or getting stuck in the crowds. Check the Cam-Plex website for the most up to date events going on in Campbell County. If you’re moving to WY, you’ll soon find out summers are hot and dry and winters are cold and dry. Make sure your vehicle is in good working order, with sound tires, as well as fully functioning brakes and radiator. During the winter is wise to have an emergency kit with food, water, blankets and other supplies. Between urban areas, there are long stretches of road without service areas. Make sure to bring plenty of water, and if you must stop along the way, don’t stray too far from your car. Many cities in Wyoming require licenses for both dogs and cats. Call your local city to find out what you need to do to safely bring your pet with you. Remember to change your address online with USPS before moving to WY so that your mail makes it to your new home with you. Gillette, situated in the Powder River Basin in the northeast of the state, has almost 30,000 residents and is nicknamed “Energy Capital of the World” due to its vast resources of coal, coal-bed methane gas and oil. Like most of Wyoming’s cities, Gillette was founded as a railroad town, but 120 years later in the 1970's, the huge demand for oil and coal fueled the city’s expansion. The area produces 40% of the nation’s coal and three of the top five employers here are mining companies: Peabody Energy Co, Thunder Basin Coal Company and Cloud Peak Energy. Despite its important fuel role, the city has a small-town atmosphere, so if you prefer the hustle and bustle of a more commercial city, moving to Gillette will disappoint. However, it’s important to note that the city is one of the richest in the country, with an average household income of $69,500 and a low unemployment rate. Each year, the city attracts visitors thanks to its mining history, natural surroundings and cultural activities such as the art shows at AVA Art Center, the Jazz Festival and the Gillette Community Theater. With a semi-arid, continental climate, Wyoming is one of the driest and windiest states, with an average rainfall throughout the state of less than 10 inches per year, most of it in late spring and early summer. If you’re moving to Wyoming, you’ll find some extreme temperatures as well. Summers average between 85 and 95 degrees Fahrenheit during the day, while at night, the temperature plummets. Winters are cold and snowy, with elevation making it colder in some places, but warm Chinook winds can bring unexpected warmer air. Spring and summer are also when you can expect thunderstorms and, in the southeast, even tornadoes. Listen carefully to the local weather reports when moving to WY during these seasons! The quality of life in Wyoming is enhanced by clean air and water, as well as some of the most beautiful natural surroundings in America. Despite an average household income of almost $44,000, which is higher than many other states, the cost of living in Wyoming is 2.68 percent lower than the US average. This is in large part due to the availability of land, which means housing doesn’t cost as much as in more populated areas of the country. Another reason for the lower cost of living is the absence of personal income tax, even for pensions issued from out of state. However, Wyoming levies property taxes on the local and state levels, which can cost homeowners a significant amount annually. The average sales price of a home in Wyoming in 2011 was $181,900. However, regional differences are quite big, with prices in Cheyenne and Laramie being higher than elsewhere. A single-family home in Cheyenne costs approximately $156,250, while a single family home in Laramie costs much more, with the average sales price being $215,000. Rental prices are reasonable compared to more densely populated states, with a two-bedroom home in Cheyenne costing around $870 per month, and a similar home in Laramie costing around $690 a month. Overall, it’s becoming more expensive to live in Wyoming. Between 2010 and 2011, the cost of living in Wyoming rose by 4.5 percent. Interestingly, in communities where energy and mining are driving expansion, the costs of living are increasing the most, in part due to a higher percentage of home ownership. Throughout the state, food and transportation are the main culprits of the rising cost of living in Wyoming, with food prices across the nation suffering from agricultural setbacks and gas prices remaining high. And even though the average commute time in Wyoming is only 17.8 minutes, people drive a lot because of the state’s rural nature and longer distances between homes, schools and stores. Despite the rising costs of living, Wyoming has a bright future and offers many opportunities for those interested in moving there. With a growing number of high-paying jobs, no income tax and relatively low real estate prices, it’s safe to say Wyoming offers all necessary ingredients for a prosperous future. And with an expanding educational and healthcare system, as well as cutting-edge energy technologies, it looks as if Wyoming will be a healthy place for future generations to grow old, too. Moving to Wyoming means moving to a predominantly rural state; but fortunately, it’s one that takes every measure to keep the infrastructure in good working order and all areas accessible. When planning your route, always check with the Wyoming Department of Transportation to see if the roads are clear, especially in winter, when snowfall can make driving hazardous. Roads:Three Interstates (in the south and east), 13 US highways and the Wyoming state highway system cross the state and make most inhabited areas accessible. Railroads:Railroads are predominantly used for freight in Wyoming. Airports:The Gillette / Campbell County (GCC) Airport provides daily jet service to Denver and Salt Lake. These major hubs connect to airports around the world. Parking is free at the GCC airport and it is a short, 10 minute drive from town. The Equality State typically has a low unemployment rate - lower than the US average. This is in large part thanks to the continued expansion of the energy and mining sectors, which not only provide these types of Wyoming jobs, but also create jobs in supporting sectors such as education and healthcare. In addition, there are both seasonal and permanent jobs in Wyoming tourism throughout the entire state. The first place to look for Wyoming job listings is at Wyoming at Work, an online government portal that allows employers and job seekers to connect. Here, you can create and upload a resume and cover letter, browse jobs by sector or area, and apply for open positions online. The state government also features information about Wyoming state government jobs and the labor market on its website. Energy and Mining: Much of Wyoming’s revenue comes from energy and mining, and companies such as Solvay, Halliburton, Pacificorp, Exxon, FMC Corporation, Peabody Energy and Cloud Peak Energy all provide Wyoming jobs. Look for job listings for these sectors in Cheyenne, Casper, Laramie, Gillette, Rock Springs, Sheridan, Evanston and Green River. Tourism and Recreation: With its abundance of natural beauty, the presence of some of the greatest national parks in the country, a rich Wild West history and numerous festivals and events, Wyoming attracts tourists from all four corners of the globe each year. Look for jobs in Wyoming tourism in Gillette, Cheyenne, Laramie, Gillette, Rock Springs, Riverton, Sheridan, Green River and last but not least, Jackson. Health and Medical Services: You can find Wyoming job listings in health and medical services in the Gillette, Cheyenne, Laramie and Rock Springs areas. Transportation and Distribution: Railroads and airports still create many Wyoming jobs, while a number of distribution companies are relocating here thanks to the favorable business climate. Look in Gillette, Cheyenne and Casper for Wyoming job listings in these sectors. Retail: Look for retail jobs in Wyoming in Gillette, Cheyenne, Riverton and Jackson. There are a number of good educational institutes to choose from if you’re moving to Wyoming. Schools: Campbell County School District #1 serves approximately 8,400 students grades K-12, with several new school facilities. There is one High School, with a second one slated to open in 2017 under construction. In addition, there are two private schools that offer Christian based classes for grades K-12. Higher Education: Students moving to WY can attend the University of Wyoming in Laramie or Gillette College in Gillette. Other higher educational institutions include the University of Phoenix and the Institute of Business and Medical Careers in Cheyenne, and most cities have community colleges that offer for-credit courses. Before moving to Wyoming, visit Wyoming’s Official State website for information about living and working here. Wyoming does not levy an excise tax. However, it does levy property taxes on the state and local levels. Fortunately, this is offset by Wyoming’s lack of income taxation. There is a Statewide 4% sales tax on most purchases (not including food) Some areas of the state (including Campbell County) have added an optional 1% sales tax. There are no toll roads here. Wyoming’s legislature is a citizen’s legislature and does not meet full time. They have yearly sessions starting in January or February of each year. Odd numbered years are regular sessions lasting 40 days. Even numbered years are budget sessions and last 20 days. Most legislators are easily accessible and are very involved in the communities that they represent. After moving to Wyoming, you can register to vote through your city or county clerk’s office by sending in a voter registration form. You can also register at the polls on Election Day. Wastewater and sewer are regulated by each city’s Public Service Commission. Trash and recycling are picked up curbside once a week. 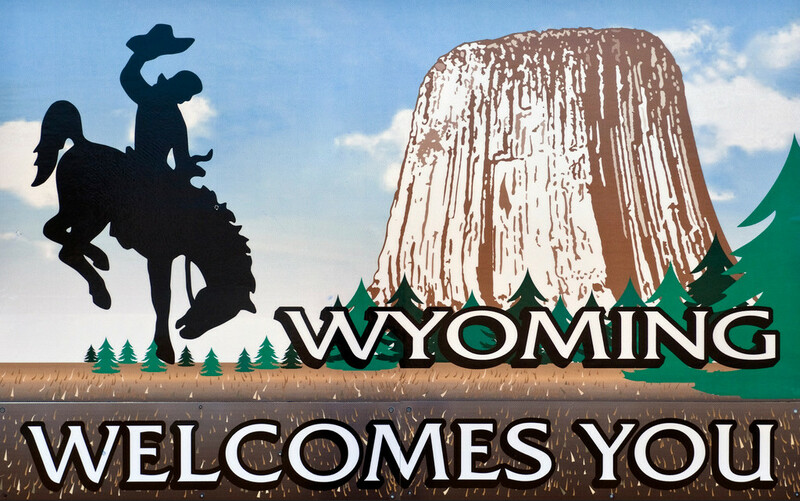 The Wyoming Department of Transportation requires that you obtain a WY driver license within 120 visiting days or as soon as you’ve secured employment after moving to WY. You must register your vehicle within 30 days of becoming a resident, and the costs vary depending on its year, make and model. It costs $9 to transfer an out-of-state title, $5 for a VIN inspection and $10 to record any lien.